…..It’s where we all want to remain for as long as possible. Our in home care team understand this need and are passionate about doing everything we can to keep you independent and at home. 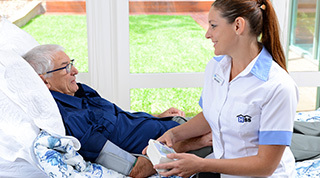 All facets of our in home care are overseen by our Registered Nurse Case Coordinators – giving you the ultimate peace of mind that an experienced and qualified Nurse is monitoring your physical and emotional wellbeing at all times. Virginia started nursing at the age of 17. During her initial years as a nurse, she continued seeing children and adult patients in hospital who, in her mind, could very easily be treated from home, thereby freeing up hospital beds, and allowing patients the benefits of remaining in their home environment. "I cannot express enough how much this service has helped me and my baby. Without this service I don’t know where I would be." "Great service – knowing that when I got home I was not on my own and great staff who were most professional, supportive and caring." "I have found the registered midwifery services provided to our younger population, notably newborn infants has been dedicated, skilled and compassionate." "As a carer for my husband, I found the service given by our nurse to be invaluable. It enabled him to be at home and for me to feel secure in the knowledge that he was being cared for." "The Occupational Therapist Assessment was fantastic. He provided lots of very helpful information and was brilliant..."